Port forwarding and port triggering are ways to route internet messages to specific computers connected to a local network. However, these terms refer to slightly different processes, which this article seeks to explain. Port forwarding (i.e. port mapping) is a method used to allow external computers access to other computers connected to private networks. Routers have a feature called NAT (network address translation) which acts as a firewall or defense from all incoming connections. Port forwarding is set up on a home router to allow incoming connections from computers such as game servers and file servers to access a user’s networked device. Network devices such as Xbox, PS4, or a home computer will not allow a user to play online games when there is a port forwarding issue with the device. The same thing applies to torrent servers and MMORPG servers in each corner of the internet. 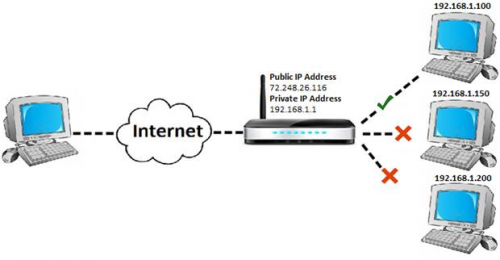 Computers connect and receive messages back from the internet using two types of IP addresses – a global IP address (public IP address) for the router and a local IP address (private IP) for the computer or other connected device. Data requested from an outside computer is seen by the router, checks the port forwarding rule, then sends the connection to the specific computer. If the port forwarding rule is configured correctly, the data is sent to the specific application or service. The connection is dropped when no rule has been set up. This router feature also protects computers from viruses and hackers connecting to any port in any networked device. Thus, port forwarding is a way to tell the router what to do with an incoming connection. Port triggering is also a way of directing connections to one or more computers. Setting up a port triggering rule on the home router will keep a specific port open for a limited amount of time. This feature is ideal in situations where multiple computers require access to a certain port in varying time frames. If a user plays online games on two separate computers, setting up port triggering on both allows the router to know which computer needs access to the port at any point in time. So what’s the difference between port forwarding and port triggering? Setting up these protocols are both done on the router. Both serve the same purpose of allowing an external computer connection to one or more computers linked to a network. However, there is one critical element that differentiates port forwarding and port triggering as two separate networking protocol. Port forwarding is a method used to allow external connections coming from other computers to one or more networked devices. This method leaves a port open on the router for an indefinite period. This feature may also prove to be relatively unsafe as it leaves other computers open to potential attacks. In contrast, port triggering leaves a port on the modem open for a determined amount of time. It is considered an automatic version of forwarding, or port forwarding with an on-off switch. Here is a presentation talking about port forwarding and port triggering.